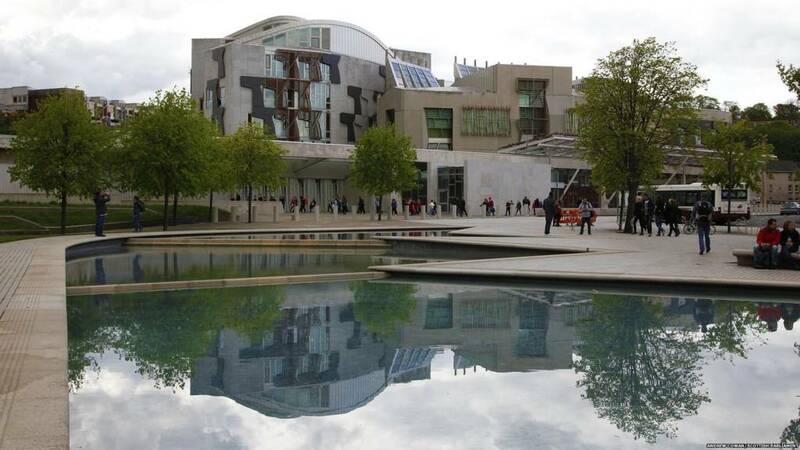 Patrick Harvie said people across the UK were now "waking up to the crisis before us"Image caption: Patrick Harvie said people across the UK were now "waking up to the crisis before us"
Goodbye from the Holyrood Live team on Wednesday 27 March 2019. The Scottish Parliament has voted for Brexit to be cancelled if the UK faces leaving the EU without a deal. MSPs voted by 89 to 28 for a motion calling for Article 50 to be revoked as a last resort if a so-called People's Vote does not happen. The motion was lodged by the Greens and was backed by the SNP and Labour, who both added their own amendments to it. The result is largely symbolic, but will increase the pressure on the UK government. Mental Health Minister Clare Haughey says the advertising of diet products and issues around body image are very closely linked. Adolescents who describe themselves as being 'too fat' report lower mental wellbeing than their peers, she tells the chamber. Diet products are not only damaging to mental health, they can also be actively dangers the minister explains. The Scottish governmnet will publish analytical details of the mental health of young women in the coming weeks, which will also cover body image Ms Haughey highlights. She says this topic will also be included in plans to improve the resilience of young people when using social media. 28-year-old Mandy Jones is now on a mission to encourage conversation around mental health with the Empowered Woman Project. Kim Kardashian West has been called a "toxic influence" for posting an advert promoting a dieting lollipop. The reality TV star shared a photo of herself eating the product - which it's claimed suppresses your appetite - onto Instagram. Ex-Radio 1 presenter Jameela Jamil, who has a campaign around body positivity, described her as a "terrible and toxic influence on young girls". Newsbeat has contacted Kim's representatives for a comment. SNP MSP Shona Robison welcomes Mandy Jones - the woman behind the petition being discussed - to the chamber. Young people are incredibly vulnerable to products which advertise speedy weight loss she states. She insists before and after photos often given an inaccurate portrayal of the products. While she praises some of the work that is done by Trading Standards to investigate diet products, Ms Robison insists more can be done. The MSP also calls on Instagram to do more to tackle the problem on its platform. The Empowered Woman Project's Mandy Jones is behind the petition. SNP MSP and former health minister Shona Robison leads a member's debate on the impact from celebrity endorsements of diet products debate. MSPs have voted for Brexit to be cancelled if the alternative is no deal. Holyrood backed a Green party motion calling for article 50, the EU Exit clause to be revoked by 89 votes to 28, with one abstention. However the vote has no practical effect. The Scottish Greens tabled a motion commending the millions who have signed the petition calling for article 50 to be revoked. They said Brexit should be cancelled immediately unless there's a second referendum with an option to remain in the EU on the ballot paper. The SNP added a line calling for the UK Government to stop ignoring Holyrood's views, while Labour said dumping brexit should be a last resort. However the Conservatives said the result f the EU referendum should be respected and delivered, which was rejected. MSPs backed the Green motion by 89 votes to 28 with one abstention. The abstainer was SNP MSP Alex Neil who voted to leave the EU. The Scottish government's amendment on the 'climate emergency' was narrowly defeated, with 58 voting for and 59 against. The Tory amendment was also not agreed, with 28 MSPs backing it and 90 voting against. The Labour amendment was defeated by 22 votes to 96. The final unamended motion from the Scottish Greens is not agreed with just six votes for and 111 votes against.